Posted by admin in activity reports, Kamchatka, Russia, Shiveluch. 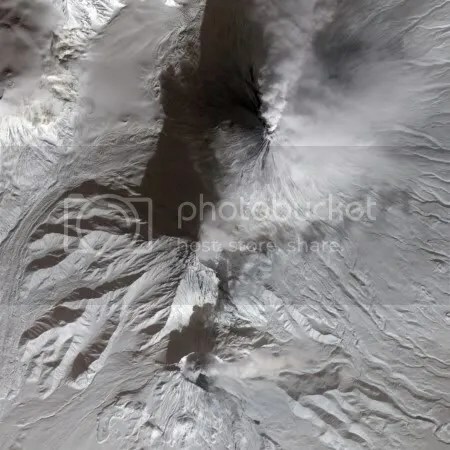 Reports from Russia say that the Kamchatkan volcano Shiveluch has produced an ash emission to an estimated altitude (based on seismic data) of 7 km. KVERT reports that the ash plume was associated with a ‘shallow seismic event’ lasting four minutes. No ashfall on nearby settlements has been reported, and KVERT says that this event poses no danger to local communities. No volcanic ash advisory has been issued by Tokyo VAAC for this event. Posted by admin in Kamchatka, Russia, volcano monitoring. Scientists of KVERT Project return to the full KVERT operations (the information ensuring of air services for the results of daily analysis and evaluation of activity of Kamchatka and Northern Kuriles volcanoes) and will discharge these obligations for 01 February – 30 April 2010. An announcement on the KVERT updates page explains that ‘a temporary funding agreement’ has been reached ‘and the KVERT Project has returned to full operations … The temporary agreement will fund the KVERT Project until 30 April 2010’. This is good news in the short term, but KVERT needs to be put on a permanent, stable footing if it is to do its vital job effectively. Posted by admin in Kamchatka, Russia. The Kamchatka Volcanic Eruption Response Team (KVERT) monitors the highly active volcanoes of the Kamchatka Peninsula in the Russian far east. Many international air routes pass through airspace potentially affected by volcanic eruptions on Kamchatka, and there is a very high risk of flight disruption, and even of accidents and loss of life, if volcanic activity in this region is not properly monitored. distribute information regarding volcanic activity in Kamchatka and the Northern Kuriles. This is dreadful, shameful news. The Kamchatka volcanoes cannot be left unmonitored: either the Russian government must be pressured to reconsider (and Moscow does not normally respond very well to such external pressure) or some kind of international arrangement will have to be made through which either KVERT funding can be continued or another country will have to step in, if that is possible. UPDATE. This has happened before. Funding for KVERT was last cut in 2007: an AVO news release from March 2007 can be found here. KVERT was offline from 1 March to 9 April that year. Funding also broke down for KVERT in 1994. ANOTHER UPDATE. Dr Erik Klemetti weighs in at Eruptions, with all the detail about why this is such a bad idea: Russia nixes Kamchatka and Kuril Island volcano monitoring. 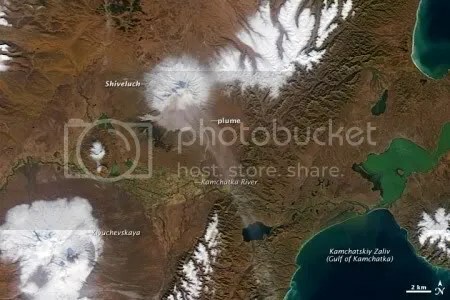 The NASA Earth Observatory have published a new image of Shiveluch volcano on the Kamchatka Peninsula, captured on 3 October 2009 by the Moderate Resolution Imaging Spectroradiometer (MODIS) on NASA’s Terra satellite. The image shows a diffuse plume dispersing to the south-east. To the south-west of Shiveluch lies Kliuchevskoi volcano, which has also been active lately, although at the time this picture was taken it seems to have been going through a quiet interlude. Activity of the volcano continues: a new viscous lava flow effuses at the lava dome. Ash explosions > 10 km (> 32,800 ft) ASL could occur at any time. The activity of the volcano could affect international and low-flying aircraft. Seismic activity of the volcano decreased: only three explosive events occurred from 02:15 till 15:46 UTC on September 11. According to an interpretation of seismic signals, ash plumes rose up to 4.5-6.5 km (14,800-21,300 ft) ASL. No visual data about this events – the volcano obscures by clouds. According to satellite data, a thermal anomaly over the lava dome was registering on September 10-11. The precise nature of this recent activity is unclear, but the reference to a ‘new viscous lava flow’ and the large explosions and ash plumes and reports of pyroclastic flows and ‘hot avalanches’ suggest a (partial?) dome collapse event. Until the weather clears and some visual data comes in (the Shiveluch webcam currently shows nothing but cloud) it’s impossible to be sure – and in any case, this phase of activity may not yet be over. Shiveluch is unusually active even for Kamchatka. Reports from Russia indicate that a large eruption of Shiveluch began yesterday. A bulletin from the Kamchatka Volcanoes Emergency Response Team (KVERT), issued at 22:35 UTC on 10 September warns that ‘Ash explosions > 10 km (>32,800 ft) ASL from the volcano could affect international and low-flying aircraft’. According to the bulletin, ‘strong explosions’ occurred between around 14:19 and 14:55 UTC on 10 September, with seismic data indicating ash plumes reaching 15000 metres above sea level; if ash plumes are indeed reaching 10-15 km altitude, then this is a sizeable event. The bulletin reports that according to seismic data ’10 volcanic events (ash explosions and hot avalanches or pyroclastic flows) occurred at the lava dome from 16:33 till 20:25 UTC on September 10′. Whether the activity is still continuing is not clear, and there are no visual or satellite images of this event because of cloud cover. Tokyo VAAC issued a volcanic ash advisory at 04:40 UTC today reporting emissions at FL210 (21000 feet / 6400 metres) at 02:16 UTC, but giving no subsequent eruption cloud observations. No further advisories have been issued, so perhaps things have calmed down again at Shiveluch. The Russian press gives no additional information on this eruption, but reports that KVERT volcanologists have said that there is no danger to local inhabitants from this burst of activity.